High-profile Las Vegas solar projects receive support from corporate, government and regulatory entities. Solar energy is definitely the most popular sector of the entire energy and utilities industry — from federal and local tax credits to media buzz and everything in between — but Las Vegas is taking the hype and turning it into high-profile projects in the commercial industry. 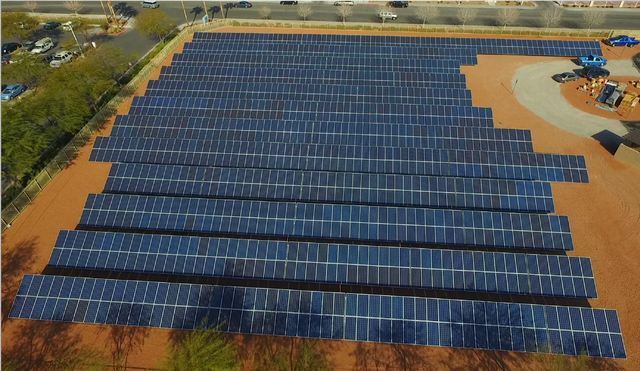 On June 20, Las Vegas Mayor Carloyn Goodman and North Las Vegas Mayor John Lee were in attendance as Cox Communications and Manheim Nevada, both subsidiaries of Cox Enterprises, dedicated two ground-mount solar projects. The Cox Las Vegas project is in Las Vegas and the Manheim Nevada project is in North Las Vegas. The projects are designed to generate power from alternative sources for their respective operations. The collaboration is resulting in installations that produce 1,523 kilowatts of clean energy, equivalent to the amount needed to power 238 homes and prevent 1,700 tons of carbon from entering the environment on an annual basis. Also a part of the collaboration was SolarCity, which provided the design services and construction management of the 427-kilowatt solar farm constructed of 1,376 solar panels on Cox’s property. The solar farm powers a data center that enables the delivery of Cox internet, cable television and telephone services to hotels, casinos, homes and offices as well as Cox Homelife to residential customers. It is the first data center in Nevada to be powered by its own solar energy and the first in any of Cox’s national markets. The solar operation produces 65 percent of the facility’s energy and prevents 486 tons of carbon from entering the environment. Its energy is equivalent to the power needed by 65 homes. Goodman has already stated that the city of Las Vegas is moving to 100 percent renewable energy for all facilities, a goal made even easier because of the favorable regulatory environment in Nevada. Primo Electric was responsible for the building power integration which coupled the solar panels to the Critical Facility service entrance that provides power to the building. In Las Vegas, the Cox Conserves department is an employee-driven initiative that was established in 2007, and in 2015 it diverted 52 percent of its waste into single stream recycling with as much as a 75 percent diversion rate in some months. SolarCity’s success has been predicated on extremely high engineering processes and standards during the implementation phase while simplifying the conversion schedule and associated operational tasks. The site of the commercial resource for this project is at Manheim Nevada, a leading provider of vehicle remarketing services, connecting buyers and sellers to a large wholesale used-vehicle marketplace and an extensive auction network. Across the country Manheim hosts 115 physical, digital and mobile auction sales, providing end-to-end inventory solutions.